St. Christopher Parish Mission Nicaragua began in response to parishioner requests for mission trips to less developed countries. Mission Nicaragua is thus a parish-based undertaking, an outgrowth of a more than 25 year relationship between St. Christopher Parish Outreach and the Nicaragua Project coordinated by Ann Marie Zon. St. Christopher Parish Outreach provides boxes of hygiene bundles, baby bundles, school supplies, boxes of clothing, furniture, etc . for the people of Nicaragua. Those who take part in succeeding trips go for a specific ministry purpose such as the expanding Eyeglass Project which is done in conjunction with some of the Lions Clubs of Western New York and Nicaragua and some area professionals. Other projects could also be undertaken depending on the background, skills and available time frame of the participants. Mission travelers in the 2012 group experienced the lunch program for children in Cristo Rey Parish, Granada. In response to the great need to feed about 400 children 1 meal five times a week, the mission group began the St. Christopher Parish Cristo Rey Rice Project. A group of parishioners returned to Cristo Rey in 2014 and helped the people paint their church. Periodically, parishioners are invited to donate bags of rice, tools, or even sporting equipment for the children or other items as a need is recognized. First level trips of up to ten people usually travel to Nicaragua during the second week of January for 12-14 days. When there is sufficient interest, another trip may be scheduled for late Fall. Travelers need to have a valid passport. No immunizations are required other than those determined by one's physician. 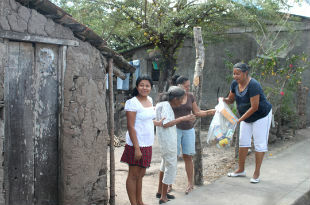 Mission travelers stay at Ann Marie Zon's house in Rivas, Nicaragua. Meals are usually eaten there with a mixture of American and Nicaraguan style food. Provision can be made for special dietary needs and allergies. There is also the opportunity to eat out from time to time. American cell phones do not work in Nicaragua. Ann Marie Zon and Fr. Alfonso can receive calls from the US and calls can be made from their phones when necessary. Phone numbers and email addresses will be provided before the trip. A knowledge of Spanish is not necessary although it is helpful. There is a significant amount of walking so good sneakers or walking shoes are helpful. The temperature in late November to the end of January is generally in the 70's. Occasionally there is some rain. The sun rises at 6 am and sets at 6 pm. Nicaragua is in the Central Time Zone. Bottled water is available at all times. There is no hot water for showers. 10. There is a person who will do laundry for visitors as needed for a stipend. 11. Travelers bring comfortable clothing including Shorts and T shirts (no short shorts). Nicaraguans dress nicely for church so women bring a dress or skirt and blouse, men khakis or nice pants and a sport shirt for example. 12. Travelers typically bring a back pack and a suitcase of clothes some of which they choose to leave for the people there. This also provides room in our luggage for souvenirs! Parish support for Mission Nicaragua is expressed in prayer, sense of responsibility for the project, publicizing the project informally/formally and fundraising. Participants in the mission trips are asked to pay as much of the travel cost as possible. Usually plane tickets are about $800...sometimes higher. Personal money brought to Nicaragua is basically for souvenirs. Parishioners are invited to sponsor/subsidize mission trips through invitations in the bulletin. Friends and family can be asked to make a donation or to organize a fundraising event in the name of one or all of the travelers. Parish Fundraisers of many kinds (e.g. Bake Sales, Car Washes, etc.) also contribute to defraying the costs of the mission trips (some ticket costs, food, lodging and transportation costs, etc.) New fund-raising ideas are always welcomed! Participants in the mission trips are asked to be available from time to time to give power-point and slide presentations to the parish and to other local groups to raise awareness and funds. Click Here to view a video of St. Chris's first mission trip to Nicaragua. Articles are prepared for LaVia, the newsletter of the Nicaragua Project, Western New York Catholic and other media.